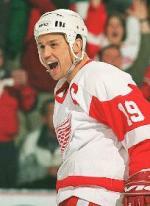 Hey, I am requesting an image of Yzerman's name plate and #19 under it and a "C" in the top right corner like it appears on his number retirement banner. (or Jersey) I recently became a mug club member at a brewery that allows for images to be etched into the glass. So I want to put Steves name, number and C on it with the arched lettering. So, that's about the size I need of it too. Thanks! Was there tonight, never heard a louder crowd at a wings game. When Smith scored I thought the building was going to collapse. Amazing, best fans in hockey. Will FSN be broadcasting the games in the first round? I know they have done the first two rounds in the past. Still gotta love the Mule, we know what he's capable of. He has appeared to be trying harder the past few weeks. I'd be that mad too if I lost to Great Britain in hockey. Holland does not need to make a big splash, I hate to say this but the wings are not winning the cup this year. The group of guys we have are definitely capable of winning the cup, but a couple years down the line once our kids develop. The very last thing I want Holland to do is trade valuable prospects for a rental aging "star", and Holland wont do that. This has been an awkward year for the wings with all the injuries that caused us to send kids up and down constantly, and the shortened season not allowing us to get in a groove. We will make the playoffs, which keeps the streak alive. Sign a defenseman and/or a scorer in the offseason, and in 3-5 years this team will have a cup. Please Holland, don't blow up our team.